PHILADELPHIA (AP) — A Pennsylvania judge ordered a nurse Monday to stand trial in the fatal fall of the father of former national security adviser H.R. McMaster while he was receiving treatment at a Philadelphia senior care facility. Judge Karen Y. Simmons issued her ruling after a two-part preliminary hearing that included hours of surveillance footage and testimony from nurses, a Health Department regulator, investigators and a medical examiner. BOGOTA, Colombia (AP) — As a meeting last August in the Oval Office to discuss sanctions on Venezuela was concluding, President Donald Trump turned to his top aides and asked an unsettling question: With a fast unraveling Venezuela threatening regional security, why can't the U.S. just simply invade the troubled country? PHILADELPHIA (AP) — There was no criminal intent for neglect in the death of the father of former national security adviser H.R. McMaster, the attorney representing the nurse charged in his death at a Philadelphia senior care facility said Tuesday. PHILADELPHIA (AP) — A nurse was charged Thursday in the death of the father of President Donald Trump's former national security adviser after authorities said she failed to give him a series of neurological exams following his fall at a Philadelphia senior care facility. A nurse intends to plead not guilty in the death of President Donald Trump's former national security adviser's father at a Philadelphia senior care facility, her lawyer says. Thirty-year-old Christann Shyvin Gainey was charged Thursday with involuntary manslaughter, neglect and records tampering in H.R. McMaster Sr.'s death. WEST PALM BEACH, Florida (AP) — John Bolton is putting his stamp on the National Security Council, announcing Friday that Mira Ricardel will be joining the group as deputy national security adviser. Ricardel has served three administrations, working for the departments of state, defense, and commerce and former Sen. Bob Dole. The Philadelphia nursing home where H.R. McMaster Sr. died last Friday has had an uptick in deficiencies cited by health inspectors during annual inspections in recent years, federal records show. PHILADELPHIA (AP) — Law enforcement and Pennsylvania Health Department officials are investigating the death of H.R. McMaster Sr., the father of President Donald Trump's former national security adviser, at a Philadelphia senior care facility. State and local law enforcement officials are investigating he death of H.R. McMaster Sr., the father of former national security adviser H.R. McMaster Jr., at Cathedral Village, in the Upper Roxborough section of Philadelphia. The elder McMaster died Friday of &ldquo;blunt impact head trauma,&rdquo; according to James Garrow, spokesman for the Philadelphia Medical Examiner&rsquo;s Office. Another White House National Security Council official resigned Wednesday, the third person to leave since new national security adviser John Bolton took over Monday. Deputy national security adviser for strategy Nadia Schadlow announced her resignation. She follows the departures of Tom Bossert, the president's former homeland security adviser, and Michael Anton, who was spokesman for the NSC. National Security Council spokesman Michael Anton is leaving his White House job as the new national security advisor, John Bolton, takes over. White House press secretary Sarah Huckabee Sanders confirmed Mr. Anton's departure Sunday. WASHINGTON — Outgoing national security adviser H.R. McMaster, in a parting shot at President Trump, said last week that "we have failed to impose sufficient costs" on Russia — joining a consensus view that Trump has been inexplicably soft on Vladimir Putin's assaults on democracy and stability. "Nobody has been tougher on Russia than I have," Trump announced Tuesday afternoon. WASHINGTON (AP) — As hundreds of people stood outside the White House and cheered, outgoing national security adviser H.R. McMaster strode out of the West Wing on Friday for the final time. White House employees gave a lengthy round of applause Friday afternoon for ousted national security adviser H.R. McMaster on his final day on the job. The send-off known as a "clap out" took place on a driveway next to the White House after Mr. McMaster held a final transition meeting with his successor, former ambassador John Bolton. Outgoing national security adviser H.R. McMaster is being "clapped-out" of the West Wing on his final day on the job by hundreds of cheering White House and National Security Council staffers arrayed on West Executive Avenue. NORFOLK - A new National Security team has just recently been appointed by President Donald Trump. Former CIA Director Mike Pompeo is replacing Rex Tillerson as Secretary of State and John Bolton is replacing H.R. McMaster as National Security Adviser. President Trump says the new National Security team has a very weighty role of ensuring not only that America is safe, but doing everything in their power to reduce the possibility of war and confrontation. WASHINGTON -- Joe Biden gave Donald Trump a gift last week when he engaged the president of the United States in a verbal slugfest, saying that if the two men were in high school, he'd take Trump out back and teach him a lesson. Biden was clearly kidding, speaking off-the-cuff about Trump's alleged mistreatment of women. But Trump, never one to let an insult pass -- and always eager to deflect attention from the chaos engulfing him -- responded in kind. National Security Adviser-designate John Bolton's long record of tough talk could give President Trump some much-needed rhetorical back-up in difficult upcoming negotiations with North Korean leader Kim Jong Un, some security policy watchers say, even as critics warn Mr. Bolton's appointment could undermine the delicate, multilateral diplomacy needed to strike a deal with Pyongyang. WASHINGTON (AP) — Charging ahead with the dramatic remaking of his White House, President Donald Trump said he would replace national security adviser H.R. McMaster with the former U.N. Ambassador John Bolton, a foreign policy hawk entering an administration facing key decisions on Iran and North Korea. President Donald Trump made a snap decision to oust H.R. McMaster as national security adviser, moving as the administration weighs tough actions against Russia and acting far sooner than many White House aides expected. McMaster's departure had been the subject of intense speculation in recent days, yet most administration officials thought it wouldn't come for weeks. White House Press Secretary Sarah Huckabee Sanders said just a week ago that the two men had a great working relationship. CLEVELAND, Ohio -- On March 15, the Department of Homeland Security issued a warning confirming Russia hacked into the U.S. power grid and may be able to shut it down at will. President Trump might actually have welcomed a power outage during Anderson Cooper's Friday interview with Karen McDougal, and would welcome one during Cooper's interview with Stormy Daniels on "60 Minutes" this Sunday. 1. WHAT THE WHITE HOUSE CALLS "LONG-TERM SNAP DECISIONS"
National Security Adviser H.R. McMaster departure spotlights mercurial decision-making when it comes to staffing the top ranks of government. 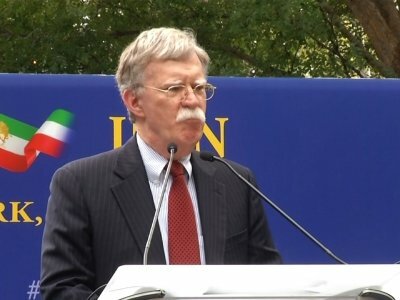 WASHINGTON (AP) — John Bolton, President Donald Trump's incoming national security adviser — and his third to date — is a divisive foreign policy figure who was an unabashed supporter of the Iraq war and advocates regime change in Iran. The Dow Jones Industrial average plunged more than 700 points after the President's announcement amid worries about a trade war with China. WASHINGTON (AP) — Charging ahead with the dramatic remaking of his White House, President Donald Trump said Thursday he would replace national security adviser H.R. McMaster with the former U.N. Ambassador John Bolton, a foreign policy hawk entering a White House facing key decisions on Iran and North Korea. President Trump said Thursday he has hired former ambassador John Bolton to replace White House national security adviser H.R. McMaster. "I am pleased to announce that, effective 4/9/18, @AmbJohnBolton will be my new National Security Advisor," Mr. Trump said. He added, "I am very thankful for the service of General H.R. McMaster who has done an outstanding job will always remain my friend. There will be an official contact handover on 4/9." Top U.S., South Korean and Japanese officials met in San Francisco over the weekend to discuss upcoming talks with North Korea on "permanent" denuclearization, the White House said Monday. White House National Security Adviser H.R. McMaster met with National Security Office Director Chung Eui-yong of South Korea and Japanese Secretary General of the National Security Secretariat Shotaro Yachi about the planned inter-Korean summit and U.S.-North Korean summits. Former White House Chief of Staff Reince Priebus said Monday that he isn't sure whether National Security Adviser H.R. McMaster intends to leave his post. "I don't know. I think that guessing game is sort of like, you know, putting a couple dollars on the lottery. I just don't know," Mr. Priebus said on "The Hugh Hewitt Show." Mr. McMaster is reportedly considering leaving his White House position to pursue a four-star position in the military. He is currently a three-star general. SEOUL, South Korea (AP) — Top U.S., South Korean and Japanese officials discussed how to achieve the denuclearization of the Korean Peninsula during weekend talks ahead of upcoming inter-Korean and U.S.-North Korean summits, Seoul said Monday. South Korean officials who visited Pyongyang recently say North Korean leader Kim Jong Un agreed to hold talks with South Korean President Moon Jae-in in late April. Seoul says Kim also proposed meeting with President Donald Trump. WASHINGTON (AP) — The White House is pushing back against talk of a staffing purge, insisting that reports of tumult and imminent departures are overblown. Chief of staff John Kelly, himself the subject of rumors that his job may be in jeopardy, has assured some staffers that they're safe, at least for now. WASHINGTON (AP) — With whispers of a staffing purge permeating the West Wing, the White House pushed back Friday and insisted that reports of tumult and imminent departures are overblown. Chief of staff John Kelly, himself the subject of rumors that his days are numbered, assured a group of staffers their jobs were safe, at least for now. The White House is pushing back against whispers of a staffing purge and insisting that reports of tumult and imminent departures are overblown. Press secretary Sarah Huckabee Sanders said Friday that chief of staff John Kelly had assured a group of staffers that their jobs were safe, at least for now. President Trump has reportedly made up his mind to fire H.R. McMaster as his national security adviser, a move long rumored. Citing "five people with knowledge of the plans," the Washington Post reported Thursday evening that Mr. Trump may not move immediately though. According to the report, Mr. Trump wants to have a well-qualified successor ready to go and wants the three-star general to make a graceful exit.